In Poland cartographic knowledge had originally come from works by Pomponius Mela, Claudius Ptolemy, and from the often inaccurate chronicles and descriptive travel accounts such as those in the report written by the Franciscan, Benedictus Polonus. He acted as translator to Joannes de Plano Carpini (1245-6), legate to Pope Innocent IV, who was sent on a mission to the Mongol Khan residing in Karakorum. Benedictus account of the journey gave Europeans (before Marco Polos II Milione) a wealth of valuable information on Mongolia and China. The oldest Polish maps were created at the time of territorial disputes with the Teutonic Order serving as documentary evidence that Pomerania rightly belonged to the Kingdom of Poland. The first such map (painted on canvas) was presented to Pope Martin V by legal representatives in 1421. Around the mid-15th c. Gdańsk-based cartographers made two sketchy maps of the lands belonging to the Teutonic Order and to the part of Pomerania including Gdańsk (Pomorze Gdańskie) which were appended to the Sędziwoj of Czechło (d. 1476) Codex. Shortly after 1450, Johannes Longinus (Jan Długosz, 1415-80) wrote the first reliable geographical description of the Kingdom of Poland (Chorographia Regni Poloniae). In the mid 1470s Marcin Bylica of Olkusz (d. 1493), astronomer at the royal court of Matthias Corvinus of Hungary, was commissioned by the king to mark the exact positions of many Hungarian towns, most probably for the preparation of a comprehensive map of Hungary. The increasingly frequent foreign travel of Polish itinerant scholars kindled their interest in maps and in the discoveries of new continents. It is most likely that while still in Kraków, Copernicus learnt about Columbuss expedition and attended lectures on cosmography during which students were introduced to the essentials of astronomy, mathematics and geography, learning how to determine the coordinates of Polish towns and cities. Among lecturers who were certainly interested in this field and who used maps were Johannes Glogoviensis (Jan z Głogowa, d. 1507) and the renowned Kraków professor, Laurentius Corvinus (Laurentius Rabe), author of Cosmographia published in Basel in 1496. Corvinus later became a good friend of Copernicus, like Marcin Biem of Olkusz (d. 1540 - the nephew of Marcin Bylica), and Bernard Wapowski (d. 1535) the father of Polish cartography. Copernicus met the latter again in Bologna and Rome. Copernicus and Wapowski allegedly assisted the Italian cartographer Marcus Beneventanus in his work on the first contemporary map of Central-Eastern Europe (Tabula moderna Poloniae, Ungariae, Boemiae, Germaniae, Russiae, Lithuaniae) appended to the 1507 edition of Ptolemys Geographia. The map, an adaptation of the mid-15th c. work of Nicholas of Cusa (Nicolaus Cusanus)), might owe its accuracy in terms of the spelling of Polish names and the placing of topographical detail on Polish lands and ziemia chełmińska (Culmerland) to Wapowski and Copernicus who might have proofread the map before its publication. Copernicus might have been so impressed by Wapowski that he decided to start making maps of his homeland himself. His first independent work was of Warmia and the western borders of Royal Prussia, commissioned by Lucas Watzenrode before the approaching international assembly at Poznań (Posen), at which the Teutonic Order wanted to reclaim the territory lost in 1466. Armed with the map he had made, Copernicus accompanied his uncle, and so the Warmian canon, Fabianus Lusianus (Fabian Tetinger von Lossainen), who searched Copernicus quarters trying to secretly steal the map to hand it over to the Order, left empty-handed. 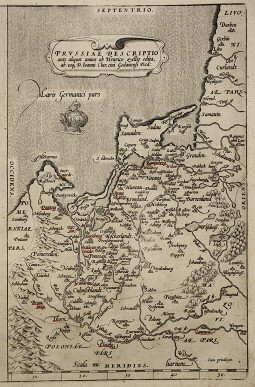 The original of the map has vanished, however, like another made in 1519 (Topographica descriptio) showing the western part of the Vistula Lagoon made to help the Bishop of Warmia in his border dispute with the town of Elbląg (Elbing). It is also known that in July 1529, commissioned by Bishop Mauritius Ferber, Nicolaus Copernicus and his good friend, the Frombork canon Alexander Sculteti, produced a map of the whole of Prussia (mappam, sive descriptionem terrarum Prussie). Unfortunately, its fate is unknown and it must have become lost or perished like the other maps he produced. Copernicus also helped Polish cartographers working on maps of northern parts of the Kingdom of Poland. He probably contributed to the Treatise on the Two Sarmatias written by Maciej of Miechów (d. 1523) in which the author corrected many mistakes found in the descriptions of Eastern Europe made by Ptolemy, and assisted Bernard Wapowski in his work on the maps printed in Florian Unglers workshop in Kraków in 1526-8. The maps were unfortunately damaged in a fire at the printing shop but from the fragments salvaged, their content was later reconstructed. Two of them, most probably originally from one large sheet, showed roughly present-day Central-Eastern Europe: the first covering the southern and central part of Poland, the northern Balkans and adjacent lands reaching up to the mouth of the river Don to the east; the second parts of Pomerania, Prussia, Samogitia, Lithuania and Livonia (ziemie pomorskie, Prusy, Żmudź, Litwa and Inflanty) including some of the Grand Duchy of Moscow. A third large map, of the Kingdom of Poland and the Duchy of Lithuania (Mappa, in qua illustrantur ditiones Regni Poloniae ac magni Ductatus Lithuaniae), is regarded as one of the greatest achievements of Polish cartography. In 1533 Wapowski was working on a map of Northern Europe (Scandinavia, Livonia and the Grand Duchy of Moscow) and two years later, when still unclear about some points, visited Copernicus in Frombork. The maps of Bernard Wapowski and Maciej of Miechów were used by other cartographers in their publications, for example in Sebastian Mnsters Cosmography (published in 1540 and 1544) and Gerard Mercators Europae descriptio of 1554. It is quite likely that Olaus Magnus also consulted them while producing his map of Scandinavia (Carta marina et descriptio septemtrionalium terrarum...) published in Venice in 1539. More accurate than those produced previously, these works popularized a cartographic representation of Polish lands that remained practically unchanged until the 18th c.
Copernicus also helped in the making of the maps of Prussia produced by Georg Joachim Rheticus in 1540, and by Rheticuss companion on his Prussian journey, Heinrich Zell, in 1542. Although the original of the former was lost, its geographic text with maps (Chorographia) covering Prussia, Poland and Lithuania fortunately survived in the Library of St Marks in Venice. Later altered several times, it was reproduced by inter alia Sebastian Mnster (1550), Abraham Ortelius (1570), Caspar Henneberger (1576), and the chronicler of Prussia, Caspar Schtz (1592). There is no need to argue the significance of De revolutionibus for the development of cartography. The mere fact that in his work Copernicus located Frombork, Kraków and Drers on the same meridian might serve as testimony to the authors cartographic expertise. De revolutionibus also confirms that, like many of his contemporaries, Copernicus attributed the discovery of the New World to Amerigo Vespucci and suggested that America should be considered a separate continent. He undoubtedly knew Martin Waldseemllers Cosmography (Cosmographiae... introductio) of 1507 which had mentioned America by this name for the first time. If he had not read it, however, he could well have studied the revised version by Jan of Stobnica (Introductio in Ptolemei Cosmographiam) published by Florian Ungler in Kraków in 1512. An outline history of cartography until the 16th c.